Tim Dowling swapped his iPhone for an original Nokia 3310 mobile phone from the year 2000 because Nokia launched an “incarnation of its classic” last week. He had problems readjusting, largely it seems because he couldn’t understand the rules of ‘Snake’. That some 100 million of those phones were sold probably means that Nokia set the world on its downward path to illiteracy. Morning commuters were no longer engrossed in their daily tabloids with folk looking over their shoulders trying to catch up on the latest gossip about the Spice Girls … who? … but were trying to play a miniature video game a bit more complicated than Pac Man. Some half a dozen years ago I had a gig out of town and ‘er Indoors insisted that I needed a pocket phone to keep in touch, so we went to Ratu Plaza, my source of computer accessories and pirated CD-roms and DVDs. All I wanted, I said, was a phone and, oh, all right then, something to receive and send text messages. I bought a Nokia 6700 Slide introduced in 2010. Unlike “Wonderful” Indonesia’s National Investment Board (BKPM), I refuse to share confidential business information via SMS. I use messages to give important information such as “I’m in a taxi and it’s macet sekali”, which ‘er Indoors will probably know anyway because she’ll be watching it live on TV. In researching this post I have explored my phone a bit further and discovered that there are also three ‘games’: Sudoku, a Chess Puzzle and, yes, Snake Xenzia. Well, I didn’t want them when I bought my communication on the move appliance. But there isn’t a camera, nor a GPS to tell me I’m lost – I like discovering that for myself. Once upon a time, to make a phone call, one had to go through an operator in a telephone exchange. Once that service was automated, there were public phones on street corners or in telkom centres. That was the system when I arrived in Indonesia in the late 80s. It wasn’t until c.1990, after an eight year wait, that a landline was introduced to my then rented house. It was useful: if we were out, there was an ansaphone to record messages, so we weren’t at its beck and call. Until quite recently we’ve had few problems, but then friends told us that they’d tried to ring us on the house phone number but no-one answered. But, we said, we were at home. We checked the phone: we could ring out ok, but when we rung its number from our handphones, there was no ringing tone. The line was live, the ring tones worked, so, we thought, there’s probably something wrong with the electronics. I bought another set yesterday. B*gger, the new one doesn’t work either. We tried every permutation possible, including changing the cable. If the problem isn’t within, then it must be outside we thought, so we called the local Telkom office. Having informed them of our woes, they did something which resulted in an SMS from them a short while later saying that everything was now fixed. Except … they hadn’t tried to call us on our landline, and no, it wasn’t fixed. We’re expecting a personal visit from a Telkom engineer or two a bit later today. Polite young guy comes, checks and discovers that we have a problem; his office hadn’t given him the details. We await his return once he has checked the cable beyond our immediate area. The Guardian had several retreats pictured this week, and of them all, I fancy Ian FIeming’s the most for when I (won’t) write the novel we’re all supposed to have within us. I certainly wouldn’t choose J.K. Rowlings’ enforced choice. What’s more, three years ago I discovered the place I’ve would choose if … . The following is a post on Jakartass Travels, a blog I’ve set up as an archive of the diaries I’ve kept on my worldly travels since 1971. I’ve always been in the habit of ‘having a book on the go’ and I read many during my 13 month circumnavigation of the world in 85/6. That was one motivation for setting up the book exchange in the office of Kashmir Himalayan Expeditions in during my two and a half month stay in Leh, Ladakh. 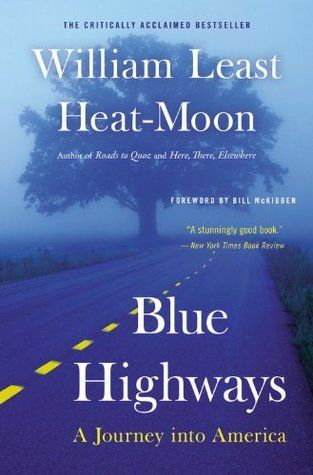 Someone deposited a copy of William Least Heat-Moon’s Blue Highways and I’m only slightly ashamed to say that once I’d dipped into it, I felt unable to return it. I’ve always thought that travel is about the journey more than the destination, and I was very happy to find someone who appeared to echo my own musings, yet made them coherent. The book is now sitting on one of my bookshelves here in Jakarta ready to be dipped into again. It’s not so much the conversations he had as he followed the roads less-travelled across America, as the seemingly random philosophical thoughts which grabbed me. Dotted through my diary are quotes from Blue Highways which resonated with me then … and still do now. This post brings them together. My page references are from the Picador edition pub. 1983. It is a contention of Heat Moon’s – believing as he does that any traveller who misses the journey misses all he’s going to get – that a man becomes his attentions. His observations and curiosity, they make and remake him. Etymology: ‘curious’, once related to cure, once meant ‘carefully observant’. ‘Absurd’, by the way, derives from a Latin word meaning ‘deaf, dulled’. Maybe the road could provide a therapy through observation and obvious, a means whereby the outer eye opens an inner one. STOP, LOOK, LISTEN, the old railroad signs warned. Walt Whitman calls it “the profound lesson of reception“. I learned to travel, then travelled to learn. What you’ve done becomes the judge of what you’re going to do – especially in other people’s minds. When you’re travelling, you are right there and then. People don’t have your past to hold against you. No yesterday’s on the road. The word ‘error’ comes from a Middle English word ‘erren’, which means to wander about, as in ‘knight errant’. The word evolved to mean ‘going astray’, and that evolved to mean ‘mistake’. As for ‘mistake’, it derives from Old Norse and once meant ‘to take wrongly’. My Writing Rules … OK? —1. Develop craftsmanship through years of wide reading. —–Include the breakfast table cornflakes boxes. —2. Always carry a notebook. —–The short-term memory only retains information for the short-term. —3. Have more than one idea on the go at any one time. —–Keep notes of them in a ‘pending folder’. —4. Write only when you have something to say. —–It is the gestation time which counts. —5. Do give the work a working title as quickly as possible. —–Own it, see it, the rest will follow. If it doesn’t, think of another. —6. Good writing needs a flow. Read it aloud to yourself, with the door shut. —7. Editing is everything. Reread, rewrite, and rearrange sentences and paragraphs. —–What is left often springs into life. —8. If it still doesn’t work, put it in your ‘pending folder’. —9. If nobody will publish your writing, do it yourself. —–Blogs are the easiest way to do that. 10. Never forget, even your own rules are there to be broken. The above were in my ‘pending folder’ and are for me the most vital of those of published authors. Did you know that President SBY has an office with a special envoy for the MDGs? Furthermore the office has rolled out a new program to raise awareness of them among the country’s youth. That’s Ibu Ani’s account, not Michelle Obama’s. Mrs. SBY has got into trouble recently for reacting angrily to some comments left on her account, but she has since apologised. The problem, as should be obvious, is that neither Instagram nor Twitter encourage ‘thought’; everything is geared to the ‘look-at-me-in-the-here-and-now’ ephemeral moment. And that’s why I’m somewhat puzzled by my lead story. The MDGs (Millenium Development Goals) are eight international development goals that were established following the Millennium Summit of the United Nations in 2000, following the adoption of the United Nations Millennium Declaration. All 189 United Nations member states at the time (there are 193 currently) and at least 23 international organizations committed to help achieve the Millennium Development Goals by 2015. So, before tweeting, perhaps it would be a good idea for “the nation’s youth” to know how much of the goals agreed upon some 13 years ago have been achieved by their elders. The best resource is the UNDP Indonesia Annual Report 2012 which can be downloaded from here (.pdf). This is my source for the following, unless otherwise stated. MDG 1 is a challenge in Indonesia despite impressive economic growth in recent decades. According to the Central Statistics Agency, almost 30 million people, or 12.36%, in Indonesia live below the national poverty line. Certain regions of Indonesia are also poorer than others; with poverty rates in regions like Papua (36.4%), Aceh and Nusa Tenggara Timurmore than double that of the national average. MDG 4. 228 per 100,000 live births in Indonesia result in maternal death in Indonesia. The maternal death rate is one of the highest in South-East Asia. MDG 5. In the area of maternal health, skilled healthcare providers attend almost all births in Jakarta compared to less than half in five other Indonesian provinces. Indonesia’s strategic longterm development plan (2005-2025) aims to achieve a “green and ever-lasting Indonesia.” This objective is further pursued in Indonesia’s second medium term development plan (2010-2014) which contains specific policies and goals on mainstreaming sustainable development and natural resource and environmental management. Don’t rely on my negative opinion about are far Indonesia has gone to achieve sustainability. Read Green Indonesia and other sites and decide for yourselves. MDG 8. UNDP, in partnership with the Indonesian Government, is working towards MDGs achievement and poverty reduction by drawing on its wealth of knowledge and vast networks of other experienced UNDP offices throughout the world. UNDP seeks to build stronger pro-poor government policy making, planning and budgeting processes, to improve service delivery, and to accelerate MDGs achievement. Accelerated development policies and programmes by national and subnational governments for Tanah Papua are now coordinated through a single body under the Office of the Vice President, rather than several government bodies, in order to increase effectiveness and pooling of resources. Government-driven poverty reduction efforts must be underwritten by sound policy, planning and budgeting. If these three components are not in place, these efforts to reduce poverty are likely to be ineffective. With this in mind, UNDP supported the Presidential Regulation No’s 65/2011 and 66/2011 on the ‘Acceleration of Development in Papua and West Papua’ and the ‘Unit for MDGs’. So, my young friends … now you’ve got the above facts, please get tweeting, 140 characters at a time. …. or is it Away With Writing? I didn’t have a distinguished academic career at Reading University’s teacher training college, but that was of little matter to the headmaster in the inner London primary school where I started my career. Fondly remembered Charlie Noakes told me that one reason he’d offered me the job was because of my application correspondence, which is lost somewhere with my UK archives. To this day I’m not sure if he meant that my handwriting, partly based on the Marion Richardson script, was highly legible or that he’d consulted a graphologist who’d adjudged my mental state and personality to be suitably crazy to face 40 nine year olds in a cramped under-resourced environment for seven hours a day. Maybe he liked the flow of my words, the structure of the writing, its concatenation, or that I used multisyllabic words when lots of short ones would have done. I don’t know, but ever since I’ve worked hard at my writing. And it hasn’t got any easier with the passing of time. There are few posts here which I haven’t slaved over; although perhaps some of the accompanying wordage to my Images of the Week have less than a hour to compose, most take much longer to complete until I’m ready to publish. However, there are several occasions when I return to edit a post, perhaps to correct a typo or spelling mistake, or to add a hyperlink. And that, for me, is one of the pleasures of the internet. I know that somewhere my musings are archived, perhaps copied verbatim and ‘shared’ or, more likely, in the mass storage systems of the NSA and GCHQ. My life is now an open e-book. I read very few tweets, and I’m not a Facebook freak. However, rather than writing at length about my joys and worries about the state of the world I share, I do post snippets of news and links to this blog on my page. I also post gleanings about Indonesian environmental issues of concern on a specific page called rather obviously Green Indonesia. That’s my way with writing, and I hope it doesn’t go away any time soon because I still enjoy writing letters.